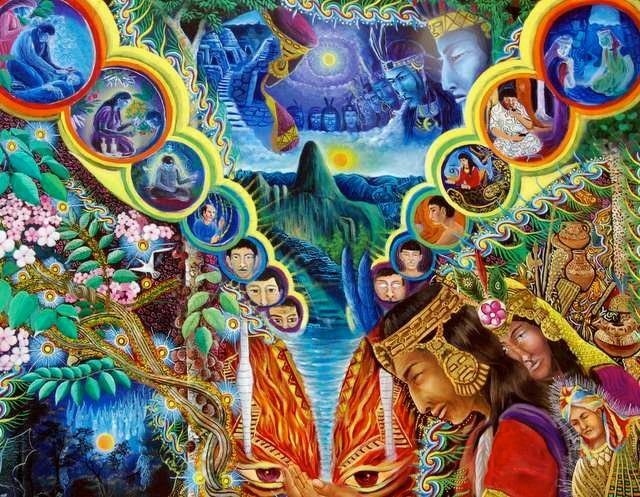 Ayahuasca is the Sacred Medicine of Divine Consciousness – composed of two ingredients, which alchemize to create this remarkable life-altering medicine. The first ingredient is chacruna or chagropanga which contains the quintessential ingredient of dimethyltryptamine (DMT). The DMT is the active ingredient that stimulates altered states of consciousness. If taken by itself, DMT stays in the body no longer than 8 to 15 minutes. Although often profound, this quick DMT experience does not allow one to explore the inner self, heal issues, or experience personal transformation. 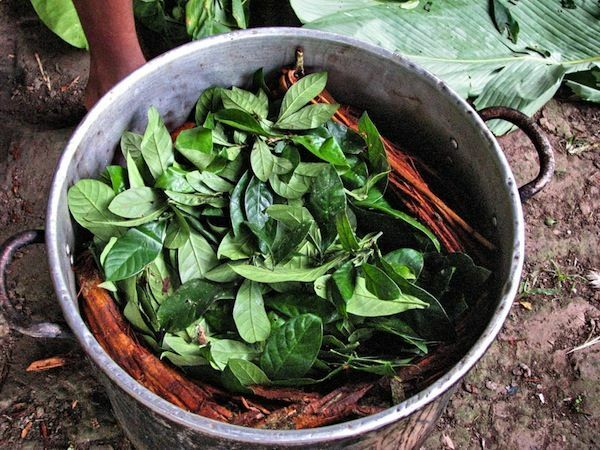 The second ingredient in Ayahuasca is Banisteriopsis Caapi which is a MAO inhibitor that allows DMT to remain in the body for up to 8 hours – bringing the real magic to the medicine. Ayahuasca can be gently stimulating to wildly mind altering, depending on the person drinking the tea, amount taken and the strength of the brew. It is very common to experience such things as, audio and visual hallucinations, inter-dimensional communications, exceptional sensory experiences, and altered states of consciousness, but Ayahuasca’s true value comes from its intrinsic ability to heal – body, mind and spirit, offering profound inner transformation, and even spiritual awakening. Ayahuasca is believed to have been around for eons, used only by the Amazonian Shamans, until England’s well-known ethno-botanist, Richard Spruce, discovered it in 1851. Since that time, Ayahuasca has made its way to virtually every continent and is the source of healing and enlightenment for an uncountable number of people around the world. Traditionally, Ayahuasca is used in Shamanic ceremony under the supervision of an experienced Shaman or guide. In life, we are presented with many challenges that are divinely intended to help us wake up and remember who we really are. These challenges may take place over months, years, or even lifetimes. Whether we call them our issues, fears, or problems, they are always a reflection of the unconscious mind – which outwardly manifests in real life experiences. The purpose of life, in this manner, is to illuminate our inner shadows so that we might heal and ultimately awaken. The power behind Ayahuasca is that it condenses a particular issue into a four to eight-hour journey. 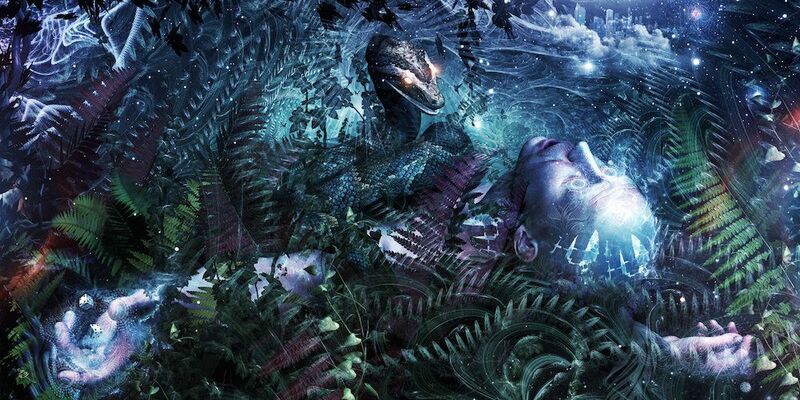 Ayahuasca does exactly what life does, just in a shorter period of time, with greater intensity and no easy escape until the transformation and healing occurs. In this way, Ayahuasca is often a shortcut to healing unhealthy patterns, vicious cycles, addictions and emotional trauma. An interesting by-product of Ayahuasca is that when you understand how it works, you have a better understanding of how life itself works. Ayahuasca mirrors life in such a way that when you move through a journey, you get to see a condensed version of how life interacts with you on a daily basis – and throughout a lifetime. In this way, you can see that life is purposeful and pushes you toward remembering who you really are. Ayahuasca just does it faster and with more intensity. Ayahuasca can be the most kind and loving experience you have ever had, or you might discover the true meaning of tough love. But any challenge that you might experience during a journey with Aya is simply the illumination of issues that exist within you; in your fears, beliefs, and the ways in which you have lived your life. The intent of Ayahuasca is never to leave you in pain, but rather to create a stress and pressure that causes you to let go and heal anything that created that internal suffering in the first place. Recognizing this inner conversation gives you a powerful advantage, and it also means that you are aware that you are intimately interacting with a Conscious Energy Force – and that you are not alone on this journey. Although you may not understand how the communication is unfolding, there is no doubt that it is happening and that “something” is being asked of you. Maybe it is to pay attention, maybe it is to let go, or maybe it is a long overdue lesson. Nonetheless, you are an active participant in a two-way communication. You might even feel as if you have met your best friend for the first time. Healing is synonymous with letting go. All healing results from letting go. When we hold on and refuse to let go, we create blocks, issues and even illness. Ayahuasca always asks you to let go. If you are good at letting go, you might not notice, but, if you are like most, “Ayahuasca induced letting go” can be difficult, but the positive results are exponential for healing, awakening and freedom from the past. Over the course of many ceremonies, Aya asked that I let go of my fears, my limiting beliefs and my identity, but it didn’t stop there. Aya also asked me to let go of my children, my life and, yes, even, free will. Anything that I could possibly hold on to, I was asked to release. Some of it was relatively easy but a great deal of it was impossibly challenging, yet, that “place inside me that knows” had no choice. With each aspect of letting go, I was a little freer, less fearful, and more open to what life was offering me. For many years, I had asked the Universe for peace. The Wise Universe sent me to Aya, and she simply asked me to let go…. and I did, over and over again – until I learned to live in a constant state of letting go, much like the flowers, the breeze and even the stars in the sky. I discovered that as stress is activated by holding on, peace is induced by letting go. I spent a great deal of my life looking for what I call “God” – going to the Amazon and doing Ayahuasca was definitely part of that path. It was night three in the Peruvian Jungle and I had finally freed myself from the nightmare that Aya created for me. I was freed from fear and suffering, and in its place was the most intense love I have ever experienced. For the first time, love filled me with bliss and ecstasy, and even these words completely fail to describe the experience. The love that I felt for everyone in the world was beyond any experience I had ever had. In that moment, I shouted out, “I am done seeking God. This love is all I need.” Later on, the realization would come that the Love, of course, was God. Most of us experience love as a hand-me-down; we are taught about love from our parents, peers, society, and even TV. In this socialization of love, we often miss a direct and authentic experience of love – beyond personal relationships and even traditional falling in love. We think we know what love is because we follow a path of love that has been inherited through the ages, but that limited version of love is a shadow of Divine Love. This invitation often requires that you first face the darkness within as you surrender false beliefs that have limited your life, and your ability to know love. You are not likely to realize that the invitation that Aya offers is an invitation to fall into love, so when you emerge from the darkness, you might be surprised to discover that you are enveloped by a Love So Deep and profound that it swallows you up – and you become that love. Many of us are really good at avoiding truths that could set us free. The deep beauty of Ayahuasca is that it doesn’t let you get away with rationalizing, dissociating or denying the core of your issues or cause of your pain. Aya hands it all to you on a golden platter and gives you the opportunity to completely dissolve false beliefs of powerlessness, limitation, and unworthiness. This may sound too good to be true, but it requires a true willingness to face the blind spots that have kept you from waking up, and the courage to embrace something so much greater than you ever believed yourself to be. If you are ready and willing, you might also discover that Ayahuasca is the Medicine of Enlightenment.